The more I travel, the more I’m convinced that flexibility is the key to happiness, in travel and in life. Ideally, the key to happiness is to live in the moment, which is likely highly correlated to flexibility. But I don’t do living in the moment very well. I’m generally a planner, as I’ve written here before. Living in the moment is something I understand is a virtue, but it is almost impossible for me to master. But flexibility? I think I have a shot there. A few weeks ago my family vacationed in Berlin. I booked the early flight out of Zurich because we had only three nights and lots of things we wanted to do. We had activities planned for our whole day once we arrived. But after getting up before five a.m., taking the train, checking in, settling ourselves on the airplane, and leaving the gate, we sat on the tarmac. I was hoping the kids could catch a short nap during the flight since they got up so early; it would have to be a short nap because the flight from Zurich was only an hour. My daughter settled in against me. Then we heard the voice over the speaker: there was a technical issue with the airplane. Mechanics were coming to check it out. I groaned inwardly. We might arrive in Berlin an hour or so later than I had planned. We would have to rearrange the itinerary a bit. But I was wrong. We waited some more; the problem couldn’t be fixed; we had to go back to the gate; I stood in a line for two hours to get re-routed. When I finally got to the transfer desk and told the harried service rep there were four of us who needed to travel together, she looked at me in disbelief. There were no more direct flights to Berlin with seats available that day. We could fly through Warsaw; no, we couldn’t. We could spend the night and come back the next day. There was a chance they still had four seats available on a flight through Heathrow. Following my own my temporary inability to register what she was telling me, that there were NO DIRECT FLIGHTS left, we all rallied. Okay, we’d take the flight through London. We’d shop for English language magazines at Heathrow. We’d still get to Berlin. And that is what we did. And when we finally arrived at seven that evening, we were greeted warmly by the staff at the hotel and our lovely, modern apartment was waiting for us. Because I’m a planner, I tend to always have an end game in my sights: how something in the future is supposed to play out, its attributes, what I’ll enjoy. But I realize this trait can keep me from appreciating elements which don’t correspond to the vision in my head. My experience of Berlin illustrates this perfectly. Described on paper, Berlin would not be my ideal of a city. It is vastly spread out, a hodge-podge of styles. Some of it is cold and ugly: there are open, empty blank spaces and gray, deserted industrial-looking yards. But, perhaps because I was primed for flexibility after our less-than-ideal entry, I was open to my intuition in Berlin. Our first morning there, we simply walked. It was a lovely fall day. We stopped in at a restaurant and enjoyed an impromptu brunch. The waitress was friendly and let me speak German with her. We took in an audio tour of the story of Berlin. 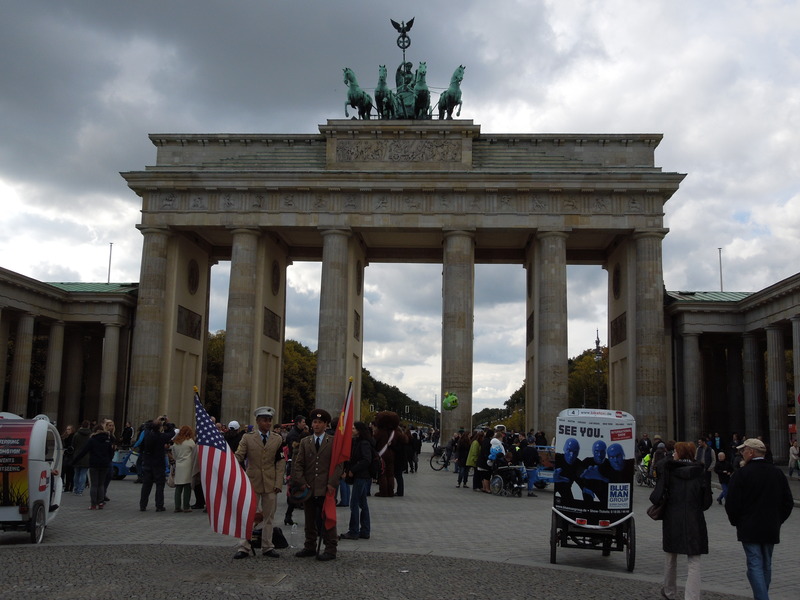 We wandered all the way to the Brandenburg Gate, which I had seen years ago when the wall was still up. We enjoyed a relaxed, unplanned day in the city. And we all fell in love with Berlin. I still have work to do on the flexibility front. But I’m making progress. Sounds like you’re doing pretty well on the flexibility front. Hope Smiths at Heathrow didn’t disappoint! After reading your post I quite fancy a trip to Berlin myself. Hi Eva, Smiths did NOT disappoint, thanks for asking! And thanks for the comment. Berlin is just great; my husband and I were even looking at real estate listings! A person can dream. Thank you for the NaNo encouragement!! Hi Erin, I don’t know how I missed your comment for so long, but, belatedly, thanks for commenting. Berlin is excellent – I wish to go again soon. And now you’re finished with NaNoWriMo, and I’m sure you did great! I’m looking forward to hearing what you learned (or didn’t) from the experience. It’s on my goals list again for 2013!